Take a Photo of Your Studio / Creative Space and Win! First place winner will win 3 levels of the course of your choice with Dubspot Online. Second prize is a weekend workshop via Dubspot NYC. Third prize is a Dubspot t-shirt. Contest ends on November 24, so get snapping and send us your photos! Purchase not necessary to enter contest, nor does it affect outcome. 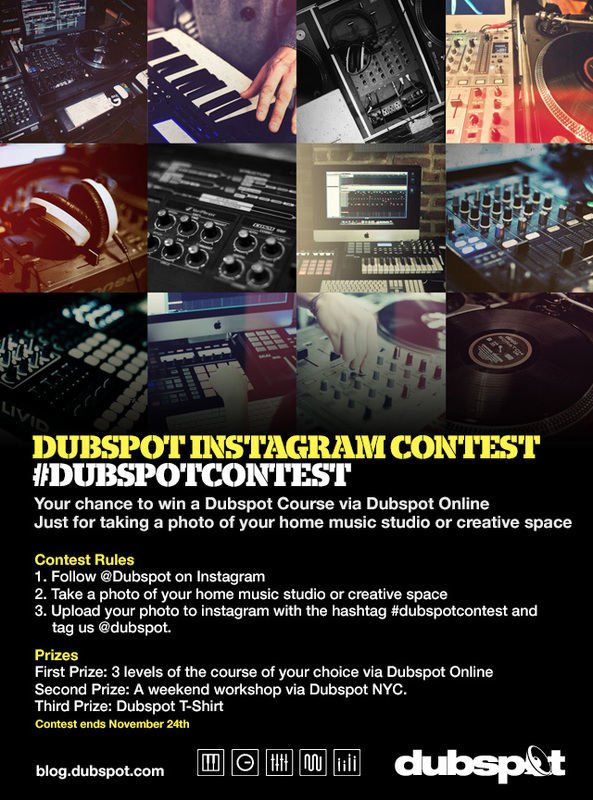 By participating in #dubspotcontest on Instagram (the “Contest”), you agree to these terms and conditions. Contest void where prohibited by law. The Contest begins October 24, 2012, and ends November 24th, 2012 at 11:59pm EST. Follow @dubspot on Instagram. Within the Contest duration, submit an original photo of your home music studio or creative space on Instagram with the tag @dubspot and with the hashtag #dubspotcontest (your “Entry”). Your Entry must abide by the below “Entry Requirements” in order to be considered, and you must comply with the below “Additional Rules” to be eligible. 1. Grand Prize: Three Levels of any Dubspot Online course. The authorized account holder of the e-mail address registered with the Instagram account posting the winning Entry (the “Winner”) will win three levels of any Dubspot Online course. For example, the Winner may select level one of three different courses, or levels one through three of a single course, or some combination in between. For more information about our courses, visit www.dubspot.com/courses. The Winner will be selected based on merit and not by chance, but in any event in our sole and absolute discretion. Selection criteria include, but are not limited to: creativity, uniqueness, aesthetic presentation, logical design, and the like. 2. Two Runners-Up: Dubspot Weekend Workshop or T-Shirt. The first runner-up may choose between a free Dubspot Weekend Workshop at Dubspot’s New York location or a Dubspot t-shirt. The second runner-up will have the same choice only if the first runner-up rejects the free Weekend Workshop (otherwise, he/she will win only the Dubspot t-shirt). The Weekend Workshop prize includes only the course itself, and excludes all travel, lodging, or any other incidental fees. For more information about our Weekend Workshops, visit www.dubspot.com/weekend-workshops. Your Entry must be your original work, and does not infringe any copyright, trademark, privacy, publicity, or any other intellectual property right of any other person or entity, or otherwise require the consent of a third party under any applicable law. Your Entry must not contain any disparaging, defamatory, sexually explicit, obscene, or other inappropriate content. We reserve our right to exclude any Entry from the Contest as ineligible in our sole discretion. Your Entry must not have been previously published. You must be the sole author and owner of, or own the legal rights to, or have all necessary permissions in writing to submit your Entry. Only one Entry per person per day. You may be disqualified for submitting more than one Entry per day. By submitting an Entry, you agree to grant us an irrevocable, perpetual, royalty-free right to reproduce, store, copy, modify, transmit, publish, post, broadcast, display, adapt, exhibit, or use your Entry in our sole discretion (the “Initial License”), and you agree to hold us harmless for all costs incurred by you by reason of participation in this Contest to the maximum extent permitted by applicable law. As a condition precedent to accepting any Prize, Winner must (i) grant an exclusive license to us in addition to the rights granted by the Initial License, (ii) execute a release relating to the use of the winning Entry, and (iii) execute an affidavit of eligibility. We will contact the Winner as soon as practicable after the end of the Contest’s duration. While we will take reasonable efforts to contact the Winner, we reserve the right to revoke our selection and select a new Entry should the Winner not reply within 24 hours of our initial attempt.